31st August. Andrew, Gabriele, Paul, Roly & I, 12:15pm with Moodle Chat, all attended, most had never used Chat as a medium of communication and apart from some slowish typing all got on well though reluctantly at first. Paul had to leave early to take a class but could see a use for it with students. One fault, I forgot to save the text after the session for reflection. That won’t happen again. Wasted opportunity and lost information. Gabriele and Andrew indicated possibilities and a willingness to submit content and look at examples of on-line content. They also saw possibility for use with country and remote students. Roly has resources he would like adapted for the Moodle platform and Paul will be working with Andrew to come up with some opportunities to get their content up and running online. 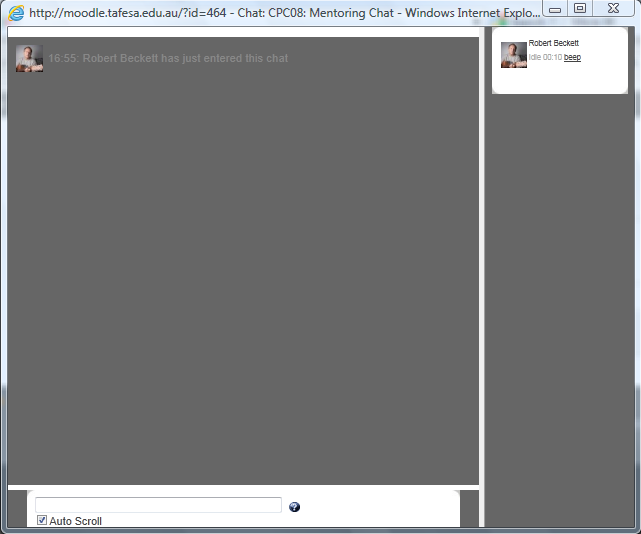 The Chat format is easy to use and can bring people together from where ever they are. Students can login from Home, Work, a Library or even their mobile Smart Phones. Chat could allow students to discuss OH&S issues they see about them actually on site. Overall a good result and some thinking focussed on elearning and what they are looking to do and have..The next step will be a Centra Synchronous session to see what they think about that method of delivery. 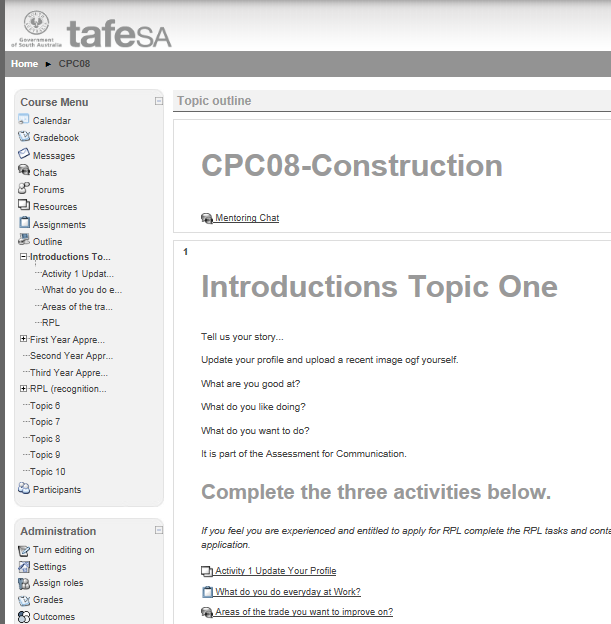 This entry was posted in Mentoring, tafeSA, Training, Wall & Ceiling Lining and tagged adelaide, gilles plains, Mentoring, tafeSA, training. Bookmark the permalink.